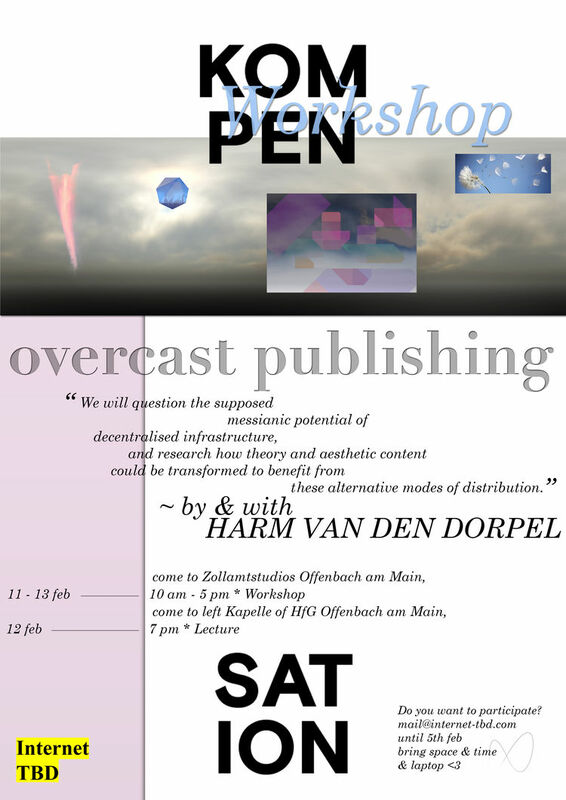 We invite you to the workshop and lecture »Overcast Publishing« organized by Internet TBD with artist Harm van den Dorpel as part of the HfG-Workshop-series »Kompensation«, this time in the field of Web. In the workshop we will question the supposed messianic potential of decentralized infrastructure, and research how theory and aesthetic content could be transformed to benefit from these alternative modes of distribution. We will have the chance to discuss, but also produce web-content with the help of Harm. Harm van den Dorpel is a dutch artist living in Berlin. He works both in painting, sculpture, and web-programming. A special favorite of Internet TBD is the alternative social media platform delinear which uses the notions of chaos and decentralized structures. After: Why do you want to work here? The Berlin based firm helps you to register your artwork on the blockchain giving it a unique ID so that you can claim ownership for it. Harm van den Dorpel's alternative social media platform delinear. It uses the notions of chaos and decentralized structures instead of the common linear order.